Special check in instructions apply to each apartment/suite. Please call North Adelaide Heritage Group after your booking is made for key collection & street address details. There is a complimentary shuttle bus that runs from the CBD past the Fire Station Inn. It is easy to walk from the CBD, 25 mins. Just 12 kms from the airport & 15kms from the Beach. Any time of the year you can enjoy a Grand lifestyle at Buxton Manor. All apartments open onto half an acre of beautiful gardens and lawns with outdoor designer furniture, umbrella's and 2 wood fire BBQs. There is complimentary off street car parking for each apartment, a communal laundry and wireless internet as well! Located on Premier quiet North Adelaide Residential Street, close to Adelaide's top restaurants, pubs, cafes and nightclubs! The Buxton Manor is a glorious, large Mansion built in 1908 in the William Morris Arts & Craft theme of decorative red brick with steep sloping roof lines and beveled diamond shaped, lead lighted windows, surrounded by half an acre of very manicured, welcoming gardens with masses of old fashioned scented roses, cottage flowers and sweeping lawns. 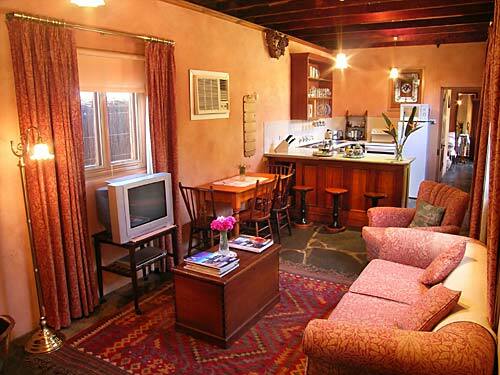 It has been heritage listed by the government and completely restored by your hosts, Rodney & Regina Twiss. 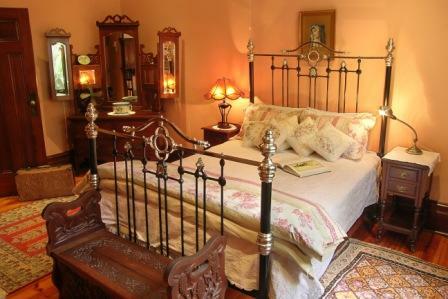 It houses our best collection of Australian antiques and memorabilia and features open log fires, polished spruce floors, decorative fireplaces, marbleized ceilings, rag rolled faux paint finishes , ornate ceiling roses, gilt mirrors and sumptuous antique beds. 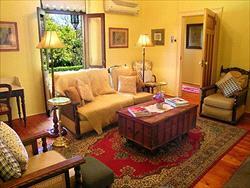 It lies in the heart of the exclusive historic area of North Adelaide, part of the City of Adelaide. Nth Adelaide Large Apartment, 'George Lowe Esquire" features 2 bedrooms, grand living and dining room, full kitchen, front porch and bathroom. Luxury Spacious Apartment, 'Musica Viva', features a spacious master bedroom, huge intimate drawing room, chesterfields, bedroom annex, full kitchen and bathroom. Buxton 2 Bedroom, 'The Butlers Suite', features two master bedrooms, huge heritage bathroom, club drawing room, full kitchen, cellar dining room and sunroom. Executive 3 Bedroom Apartment, 'Garden & Loft', is a fully self contained, 3 bedroom apartment offering a full kitchen, separate living room, with French doors opening out to sweeping lawns. Luxury Spa Cottage, 'Paprika Cottage', features 1 queen size bedroom and single bedroom, bathroom with 2 person spa, kitchen, sitting room and front private latticed porch. There is complimentary secure off street car parking and complimentary laundry for your convenience. ***North Adelaide Heritage Group maintains a strict no-noise policy and unauthorized parties, group gatherings and functions are strictly prohibited. Breach of this policy will result in the offending guests being required to leave the premises with no refund. Smoking is not permitted indoors. Should smoking occur within our accommodation a minimum charge of AUD$100 will be applied. Fodors Travel, the foremost name in travel publishing, has named the North Adelaide Heritage Group a 2009 Fodors Choice selection. This distinction recognizes a remarkable achievement for us, receiving this award for the 4th consecutive year!! Butlers Suite is a beautifully unique, 2 bedroom apartment offering a queen bed in the master bedroom and a double and single bed in the second bedroom. The Butlers offers a comfortable living area, sun room and fully equipped kitchen and of course private bathroom. Rate is for 2 adults in one queen bed, any extra persons is charged at the extra persons rate of A$62ea per adult and A$30ea per child. Paprika is a fully self contained cottage offering 2 bedrooms (1queen, 1single), full kitchen, and a king size spa bathroom. The cottage is furnished with beautiful Australian arts & crafts antiques and has beautiful views onto the English rose gardens. Rate is for 2 adults in one queen bed, any extra persons is charged at the extra persons rate of A$62ea per adult and A$30ea per child. 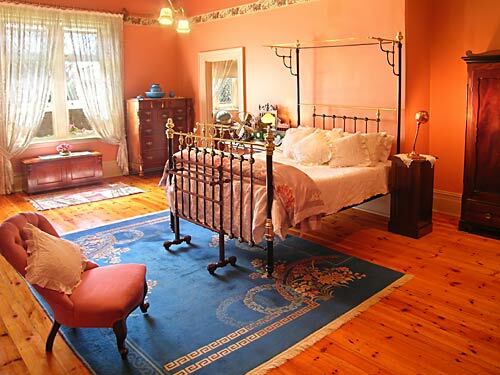 Musica Viva apartment at Buxton Manor is a one bedroom (king half testa canopied antique bed and 1 single bed), bathroom with bath and shower, huge drawing room with a dining table, study, kitchen and pantry complete with reverse cycle ducted air conditioning and central heating. Rate is for 2 people only. Magnificent spacious Apartment with stunning antiques. 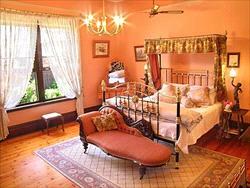 Offers 2 bedrooms with 1 queen bed, 1 double bed & 1 single bed. Features off street parking. Close to North Adelaide Shops & Cafes. Spectacular lounge room. Non Smoking. Wireless Internet connection available. Rate is for 2 adults in one queen bed, any extra persons is charged at the extra persons rate of A$62ea per adult and A$30ea per child.